I've been working with the same technology stack for an amazingly long nine years. This has given me much opportunity to work with the same types of issues over and over, and in doing so, I've refined my approach quite a bit. Thus, here's a post that is essentially an improvement on a two year old post, How to Revive a Failed Search Node. I hope this post will offer both a better description of the problem and a better solution to it. The WebCenter Interaction search product has two features that can interfere with each other. First, on the search cluster, you can schedule checkpoints to essentially wrap up and archive the search index to give you the ability to later restore it. Second, on the search nodes, at startup the node's index looks to the directories on the search cluster to synchronize in a copy of the latest index. Indeed, if you look at the path that was shown in the error, you'll find that the numbered folder no longer exists. Perhaps the latest folder will be SearchCluster\requests\1_1574_256. To find the name of the search service that goes in the first parameter, open your Windows services panel, find your search node, right-click into its properties page, and find the "service name" value. This is not the same as the display name. The service name by default is [machine][node] as far as I can tell. So on my box (bbenac02) as the first node, my service name is bbenac0201. 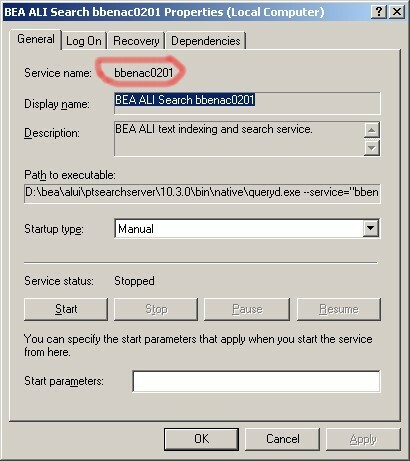 This is different from the display name, which defaults to something like "BEA ALI Search bbenac0201." Thanks for the batch file. You always seem to post something right before I need it. After starting the search service, do we need to do anything to rebuild the indexes? I'm glad this post was relevant for you. To answer your question, nothing needs to be done at the end of the process other than starting the service. At startup, the node with its empty index looks at the cluster to see whether it is in sync. It sees that it needs to update its content, so it spins for sometimes several minutes to copy in the content from the cluster. Hi Bill, I need some advice. I am running ALUI 6.1 Search, and my cluster files are growing to be rather large, about 65GB. How would I purge old files, or is there way to reduce the space taken up? This is where the buildup is, the oldest folder 0_1_256 is dated 6/10/2007. The most recent is today of course. Do I need to keep all of these folders? Are you running regular checkpoints on your search cluster? This can be scheduled from within the search cluster manager utility. Try running these nightly. You will need a lot of disk space for the first checkpoint if you've never run it before, and it sounds like you haven't. Are your search nodes similarly large? If not, then you can know that the cruft is just in the cluster and it should clear out after checkpointing (which you should run at least every weekend if not nightly). If the nodes are also huge, then you could look at using multiple search partitions since nodes aren't supposed to be bigger than about 10gb. Hi Bill, the node itself is about 900MB. No, I have not run checkpoints before. The problem is, only 1GB space is free on the D drive. Can I delete the old folders from 2007-2008 from the requests directory and then run a checkpoint? Purge the cluster with cadmin command? If I can, I will schedule the checkpoints after to run nightly as suggested. I /think/ those request folders are only important if you have more than one node in your cluster, and even when you have multiple nodes, I think those request folders are only need to be read once by the secondary nodes. So I /think/ you would be safe deleting those old request folders, but I'm not sure. DO NOT purge the cluster! That would get rid of your entire search index, and your node(s) would remove all their content. This page contains a single entry by bill published on September 3, 2009 11:59 AM. The Phantom Menance: Errors From Obsolete User IDs was the previous entry in this blog. Is that a [BLANK] or a Bug? Resetting Login Tokens. is the next entry in this blog.